“Now is the moment to reflect on the change that will make us more ourselves and make the Alma Mater of the Nation more the global leader we aspire to be,” she said. Rowe was inaugurated as W&M’s 28th president — and first woman president — during the university’s annual Charter Day ceremony Feb. 8. More than 4,000 people attended the event in Kaplan Arena. The ceremony also featured the re-investiture of Robert M. Gates ’65, L.H.D. ’98 who was originally invested on Charter Day in 2012. "I am proud and honored to continue to serve as your chancellor as you help to right this nation's course," Gates told the W&M community. The annual Charter Day ceremony remembers the university’s founding by British royal charter in 1693. 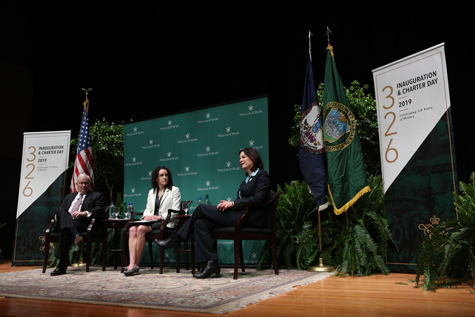 This year’s celebration, in honor of W&M’s 326th “birthday.” featured several special events throughout the weekend, including a discussion with Gates and Rowe about higher education and civil discourse, a block party and a forum on how W&M is preparing students for the future. The ceremony was streamed live on Facebook with pre-event commentary from Mike Tierney '87, M.A. '88, George and Mary Hylton Professor of International Relations and co-director of the W&M Global Research Institute, and Kay Floyd '05, director of the Whole of Government Center of Excellence. More than 140 academic institutions and learned societies were represented at the event by delegates from across the country and beyond. Three former W&M presidents were also in attendance: Taylor Reveley, Timothy Sullivan and Paul Verkhuil. Henry Hart, Mildred and J.B. Hickman Professor of English and Humanities and poet laureate of Virginia, delivered a poem he wrote to mark the inauguration. Virginia Supreme Court Justice Bill Mims ’79 brought tidings from the Commonwealth. “President Rowe, we are grateful that you have brought your vision, your passion — and yes, your Frisbee — to the Commonwealth. Chancellor Gates, we are grateful that your lifetime of splendid service will continue to include your alma mater,” said Mims, who briefly addressed current events that has embroiled many in the state capitol. “Life, love and work are never seen as zero-sum games for President Katherine Rowe; rather, she operates as if the universe is expansive, and in which everyone can win, advance and thrive. With “Kind” meaning both “kin” and “natural, true or innate” during the Renaissance, Milton used the phrase to illustrate that “it is via transformation that we discover what we value most and can then grow towards it,” said Rowe. The need for change now is something being felt across higher education, said Rowe. Rowe spent the seven months before her inauguration looking for ideas about the “best recipes for transformation” from the W&M community, and found many, including an entrepreneurial approach to disciplined experimentation, the practice of reflection and an openness to question assumptions about the future of discovery, learning and work, she said. “Now, on the 100th anniversary of co-education and 50 years after our first African American students were in residence, we celebrate each change that makes us more ourselves,” she said. “Indeed, the promises of innovation, inclusion and partnership have been hallmarks of this institution since our Charter, down to the ampersand in our name: professionals and citizens, ‘loved of old’ and ‘in all time coming,’ Alma Mater to our nation’s founders and innovator for its future. The Charter Day festivities began Jan. 31 with an awards ceremony in which the annual Thomas Jefferson awards and Monroe Prize were presented. This year’s Plumeri Award recipients were also announced at the event; those awards will be presented later this semester. Silvia Tandeciarz, chair of modern languages and literatures and professor of Hispanic studies, received the Thomas Jefferson Award, and Jennifer Gully took home the Thomas Jefferson Teaching Award. Two students also received awards: Florence “Flo” Glynn ’19 received the Monroe Prize in Civic Leadership, and Jacopo Gliozzi ’19 received the Thomas Jefferson Prize in Natural Philosophy. The Plumeri Faculty Excellence winners are Carol Sheriff, professor of history; Andreas Stathopolous, professor of computer science; Dan Cristol, chancellor professor of biology; Rajiv Kohli, John N. Dalton Memorial Professor of Business; James Kaste, associate professor of geology and director of environmental science and policy; Artisia Green, associate professor of theatre and Africana studies, Sharpe Associate Professor of Civic Renewal & Entrepreneurship, and director of Africana studies; Jaime Settle, associate professor of government; Robert Hale, professor of marine science; and John Swaddle, Class of 1938 Professor of Biology. Matthew Crispino, director of swimming, was announced as the Plumeri Athletics Excellence winner. Friday’s “Future of” series championed by Rowe began with a demonstration of the Future of Work. A weekly “Rocket Pitch” event takes place each Friday at the Alan B. Miller Entrepreneurial Center inside the Raymond A. Mason School of Business. Contestants have 90 seconds to wow a panel of judges by identifying a problem, the scope of the problem, proposing a solution and analyzing what competition is doing. The winner receives $100, and points that lead to additional prizes. Moises Romero outlasted two other competitors with his proposal for a software tool that construction contractors can use to communicate with fellow contractors and more quickly find qualified help to keep projects moving in a timely manner. The Future of Knowledge segment focused on Big Data and artificial intelligence. SCHISM is a hydrodynamic model developed by W&M’s Virginia Institute of Marine Science to visualize sea rise, population centers and “tomorrow’s flooding today.” An extensive look at Bangkok and Hampton Roads was featured. Finally, the Lewis B. Puller, Jr., Veterans Benefits Clinic was featured in the Future of Service segment. Each Monday, on what is known as “Military Mondays,” veterans in need of assistance meet with counselors at local Starbucks to review their cases and receive guidance on what to do to resolve their issues with the Veterans Administration. The Puller Clinic is the first to combine legal and psychological services for veterans, and a reenactment was performed in front of a large audience at Brinkley Commons. Celebrating the intersection of “tradition and innovation,” Friday evening’s block party was teeming with students, faculty and staff, alumni and members of the Williamsburg community to commemorate the official founding of William & Mary as well as honor those who serve and belong at the university. 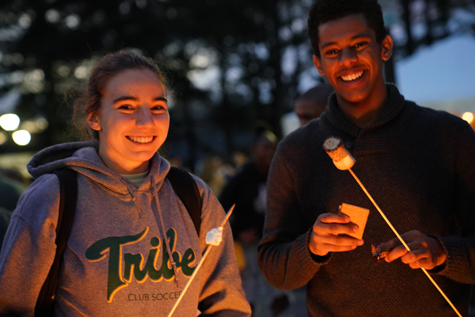 Participants enjoyed the free hot chocolate and cider, food trucks and catered treats, and the fire pit to nibble on s’mores. 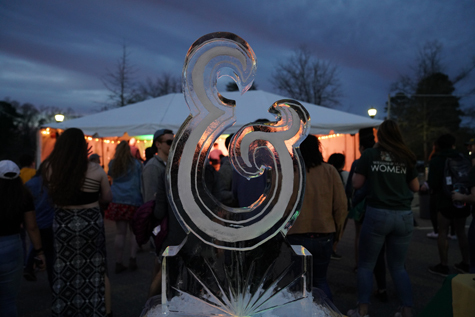 At the center of the party, a large ice sculpture of the ampersand stood prominently. This new feature of Charter Day was a hit with the William & Mary community. Many of the attendees appreciated the variety of features present at the block party, including live music performed by various student groups. The inauguration of Rowe seemed like the perfect time and place to usher in a possible new tradition of the block party following the Charter Day ceremony. And for many, it feels like a tacit way of communicating the necessary bond between students and faculty and staff, tradition and looking forward to the future. “It feels more like the Katherine Rowe kind of vibe that’s going forward at this school,” said Becca Schlegel ’19. Jim Ducibella and Jo Rozycki '20 contributed to this story.